Picture yourself, you're sitting on a grassy bank with your feet gently dangling in the cool, clear water of the Cane River. You look up, the sun is warm on your face, you shade your eyes and look past the river to see rows and rows of pecan trees - they seem to go on forever - green and lush against the bright blue Louisiana sky. 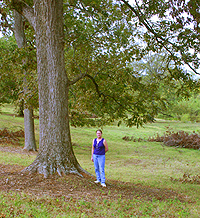 You are surrounded by the pecan orchard of Natchitoches Pecans in picturesque Little Eva Plantation. This plantation, originally called Hidden Hill half a century ago, is said to be the real location that inspired Harriet Beecher Stowe's classic novel, Uncle Tom's Cabin. Hidden Hill was also the birthplace of American Folk Artist Clementine Hunter. Driving due NW on Highway 1 through Natchitoches Parish, you can't help but get a feel for that bygone era. This family owned and operated pecan orchard brings the crops to market with the help of the entire family. From scouting insects, fertilizing, pruning, and harvesting to minding the store each Fall, each family member has a task that helps bring our customers the highest quality pecans. Mark Swanson sees to the everyday operations while his wife Julie takes care of Little Eva's Pecan Store and the mail order business. Mothers, brothers, sisters, nieces, and nephews all help wherever needed! Our company takes pride in having supplied the Louisiana Pecan Festival Country Store with top quality fresh pecans for many years!!! DESIRABLE - A variety of pecan large in size with a golden kernel and excellent taste. A "semi paper-shell" and the most popular pecan for all round use. Over fifty percent of our orchard is Desirable. ELLIOT - Always our personnel favorite. This smaller tear drop shaped nut has a bit harder shell to crack than the Desirable but their taste is so buttery sweet that we have termed them "gold nuggets".